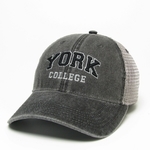 Add York College to any outfit with hats, ties, and more! Fits to most heads, with an adjustable back. Designed to keep you dry and cool while leading an active lifestyle, with a premium, moisture-wicking sweatband, and a velcro closure allows for easy adjustment while worn. Legacy Ccoolfit visor features breathable polyester with a stretch headband perfect for sunny days. Legacy ATV Trucker hat features country camo on the front and mesh backing with an adjustable strap. 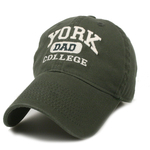 Legacy dark green adjustable hat with Dad between York College embroidery in white. 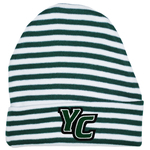 Legacy dark green adjustable hat with York Baseball embroidery in white. Adjustable canvas ball cap with white stitching on the front. 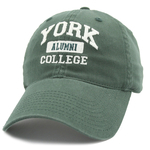 Split York College Y on the front and York College on the back of hat. Legacy dark green adjustable hat with York Swimming embroidery in white. 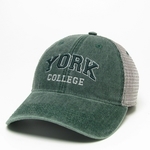 Adjustable strap ladies hat made with Oxford cloth featuring the York College Shield. Our Legacy OFA EST. 1787 trucker hat has a mesh back with an adjustable strap to fit all heads. Unstructured low profile fit with Supersoft mesh. This Legacy OFA trucker hat has YCP over York College and a Spartan head on the side. Twill hat with a front color panel and snap adjustment closure. The hat has an embroidered imprint on the front. Legacy adjustable trucker hat with York over College sewn into the front. Legacy Waxed Cotton Hat offers a fantastic fit and with a light wax finish to hold off the elements for your outdoor adventures.